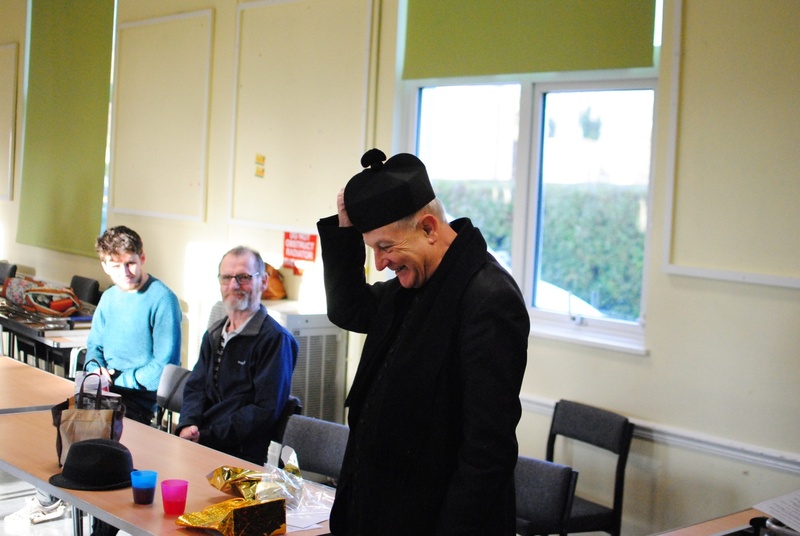 Father Patrick gets a biretta! It all started over coffee in the hall after the Latin Mass a few months ago. Fr Patrick Hutton, the Parish Priest at Christ the King, admitted to losing his biretta at the cemetery a while back and regretting its loss. We were aware that Fr Patrick had a big birthday coming up on 8 December, and so I suggested we replaced his biretta as a gift from the Latin Mass congregation. As this was intended to be a surprise, we had to take a guess at the size and duly placed the order with Luzar Vestments on line. The biretta arrived, was wrapped and accompanied by a card of good wishes; Fr Patrick is a true supporter of the Latin Mass and we are very grateful to him for his interest. Sunday 11 December was the chosen day both for our presentation and another one later in the day from the main congregation at Christ the King. Therefore over coffee in the hall, I duly presented Fr Patrick with his gift. He was clearly delighted, put it on straightaway and assured us it was a good fit. We had pre-arranged a photographer and the results are below. Happy 75th Birthday Fr Patrick and God bless you.